We are an established family run business with over 25 years of experience in the building industry. We have a primary understanding of local authority requirements and as such, we have been contracted to undertake a variety of projects in the area and beyond. We have carried out extensive high quality domestic and commercial bespoke projects with our dynamic and proficient team. Following our recent expansion, we have now relocated to our band new premises on Forest Road, which offers a wide range of services. Platinum Building Design offer a multitude of services, which range from designing to planning and construction. We have a highly experienced and committed team, delivering expert workmanship with speed and quality at every level and a fair price. We have a highly accomplished team of fully qualified gas and electrician engineers, architects and masoners, all ready to exceed your requirements. Satisfaction is at the forefront of our business. Our trustworthy, reliable and exceptionally tidy staff will ensure the highest quality work within the stipulated timeframe. Communication is also paramount to us; regular progress discussions with clients are essential so that we can work towards a clear and shared vision, resulting in superb outcomes. Working in a collaborative style, our aim is to help you achieve your objectives. 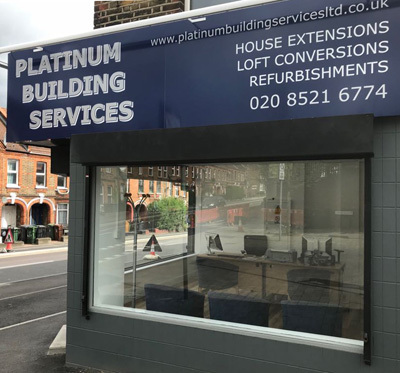 If you are considering remodelling or renovating your premises, our courteous staff at Platinum Building Services will be happy to discuss your requirements.